If your company uses JEDEC standard matrix trays for safely handling, transporting, or storing integrated circuits and other sensitive electronics, you might want to check out CCI's (Conductive Containers, Inc.) new Tacki-Pak component handling solution. CCI believes this innovation will replace JEDEC trays for good. JEDEC trays are currently used in a number of industries such as medical, photovoltaic, and more. The trays utilize individual component cells in fixed rows and columns. 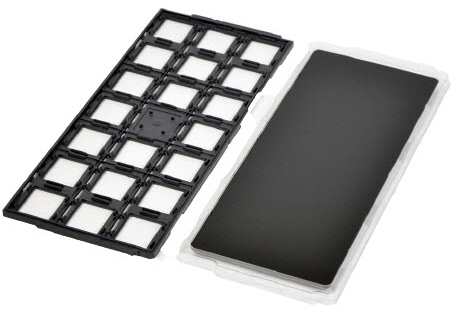 JEDEC standards set the specifications (such as what molding compounds are used in their construction and the spacing of each component cell) for these trays. CCI's new Tacki-Pak solution aims to address two factors it sees as problems with using JEDEC trays. First, in most cases, JEDEC trays do not provide any ESD protection. Second, a JEDEC tray’s set structure doesn't allow the user to use the tray if they change their component (instead a new tray must be created and purchased). The new non-adhesive, tacky surface of CCI's Tacki-Pak material offers ESD-safe properties and limits component movement thereby eliminating the possibility of parts sliding into each other (the Tacki surface holds part steady even when held vertically). Available in conductive boxes, trays, and flat sheets, the Tacki-Pak product also allows the user flexibility to place different sizes/styles of parts on the Tacki surface without the need of buying a specifically sized unit for each style of part. According to CCI, the Tacki-Pak surface is stable, reusable, cleanable, and minimizes residue transfer to the component. CCI's Tacki-Pak material is available in Tacki-Pak Component Handling Cases, Tacki-Pak Sheets, and Tacki-Pak Handling Trays. Standard and custom sizes are available as well as a choice of tacky level (I for low, non-slip tackiness, II for medium tackiness, and III for heavier items). Follow the link for more information about, or to place an order for CCI's Tacki-Pak products. Additionally, you may also give us a call at 800-966-6020, or contact us via email. For other CCI products, please visit our CCI Department.